Plant is strong with wide adaptability. 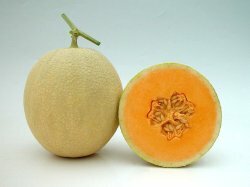 Rind is buff-yellow with attractive fine nets. Fruit is globe-shaped weighing 1.2-1.5 kg. Flesh is thick, orange, tender and rich in aroma. Sugar content is around 12-14%. After sowing, it requires 75-80 days for harvest.